The EFS appears completely transparent to the user, providing on-the-fly encryption and decryption of data with strong cryptographic algorithms. The ease of use and complete transparency to the end user creates false impression of impeccability of the Encrypting File System in the eyes of the user, who often forget about the encrypted files when they re-install Windows or transfer a disk into a new, upgraded computer. 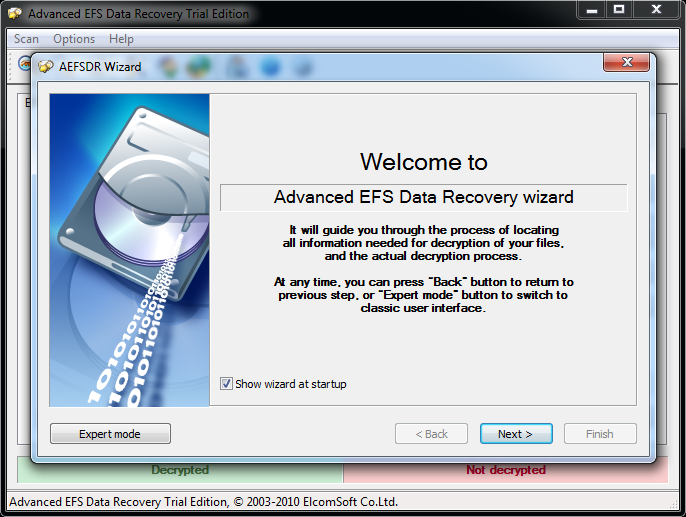 With Advanced EFS Data Recovery, instant access to EFS-protected files is often possible. The product is well aware of the EFS encryption weakness present in Windows 2000, allowing quickest recovery of the encrypted files. Supplying a valid password to the user account (or a previously used password if the password has been reset by a system adnistrator, causing EFS-protected files to become inaccessible) or an account that serves as a data recovery agent (Administrator account by default) can often provide on-the-fly decryption of the protected files. The Professional edition locates master and private keys in the deleted files as well, scanning the disk sector by sector and using patterns to locate the keys, allowing the recovery of re-formatted disks and overwritten Windows installations. Advantages and disadvantages of EFS and effective recovery of encrypted data.